In capturing images for their National Parks series of programming, Wilderness Video spent over 25,000 hours on location, creating a library of footage that wouldn't make it into the hour-long, park-specific features. 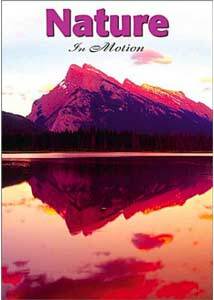 Nature in Motion combines images from many of the locations previously visited, including Big Sur, the Grand Tetons and Yellowstone, Bryce and Zion, Grand Canyon, Glacier, and Yosemite National Parks. This half-hour compilation, while also containing regular footage, is primarily time lapse photography. It features a variety of subjects, from impressive cloudscapes against scenic backdrops, to shadows crawling across a forest floor, or water ambling through a woodland setting. Mountains are conjured from the mists, a sea of grey clouds turns violent amber and crimson, and a placid summer sky saturates in the orange hues of sunset. Also included are several nighttime sequences, where the starfield traverses the heavens over the silhouette of a cactus forest or a rugged mountain skyline. Fields of colorful flowers, or select observations of wildlife also make their presence. For those who have collected the National Parks series, there are a number of familiar landmarks, and many new locations including Utah's Monument Valley, Arches and Canyonlands National Parks, Alaska's Denali Park and Arizona's Oregon Pipe Cactus State Park. The video is chaptered thematically, contrasting the different scenes, with one section for the changing skies, one for night and day, another for oceans, waterfalls and lakes. Each is set to a mix of location audio and music, but unlike previous installments in the series, there are no subtitles denoting the locations. The footage has been assembled over many years, but this is a more recent production, evidenced by a somewhat overused diagonal dissolve. While a bit shy on the runtime, this is an impressive collection of images, and for those who have enjoyed the other Wilderness Video offerings, Nature in Motion is a worthy companion. Image Transfer Review: Overall image quality is quite good, but is limited by the source material, much of which looks to be shot on video. Colors are generally saturated and vibrant, though a few scenes look a bit off color or have less punch. There are a few print defects evident, and one nighttime shot in particular has a lot of grainlike video noise. Isolated shots also have some haloing on high contrast borders, there is a bit of banding, and the odd video dropout and color bleed here and there. Audio Transfer Review: Stereo audio is pleasant, save for two chapters in which the right channel has an edge of distortion on it, which is disappointing. Separation is good, as is frequency response, however extremes are not well covered. Extras Review: Seven chapter stops are all that is included on this disc. Nature in Motion is a nice collection of time lapse photography, plus scenes collected from many of America's National Parks. Not quite the bang for the buck as other titles in this series, and the audio problems are disappointing. However, many of the locations are ones we haven't seen yet, and the footage of those we have is different, making it a good add-on.